It comes as no surprise that yesterday around noon, strong Russian army forces started their so far heaviest assault on the 7800 souls town of Vuhlehirs’k, the second biggest town within the so-called “Debaltseve bridgehead”, a territory held by the Ukrainian army and volunteer corps between the Russian-ruled “republics” of Donetsk and Luhansk. A look at the official “ATO map” shows the strategic significance of the town, not only being the last fortress between the Russian military hub of Horlivka and Ukrainian-held Debaltseve, but also key to the only open resupply route between Debaltseve and Artemivsk, further to the west. 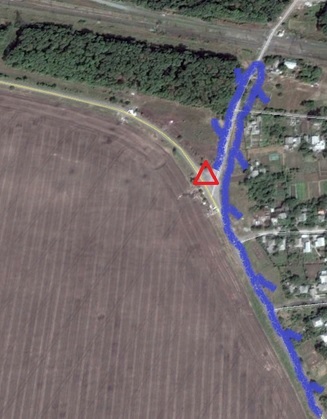 The only road, the M03, runs just 5 km to the north east of the town and whoever controls all of Vuhlehirs’k also controls the movement between some 5000 Ukrainian troops east of it and the rest of Ukraine (map). 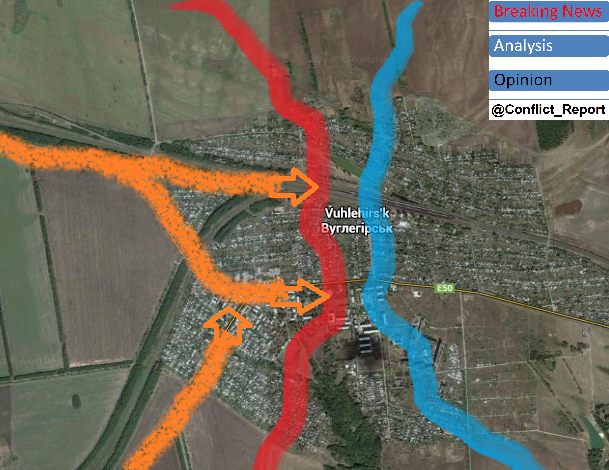 Hence, it was an imperative for Russian troops to capture this town, before starting the direct attack on Debaltseve. 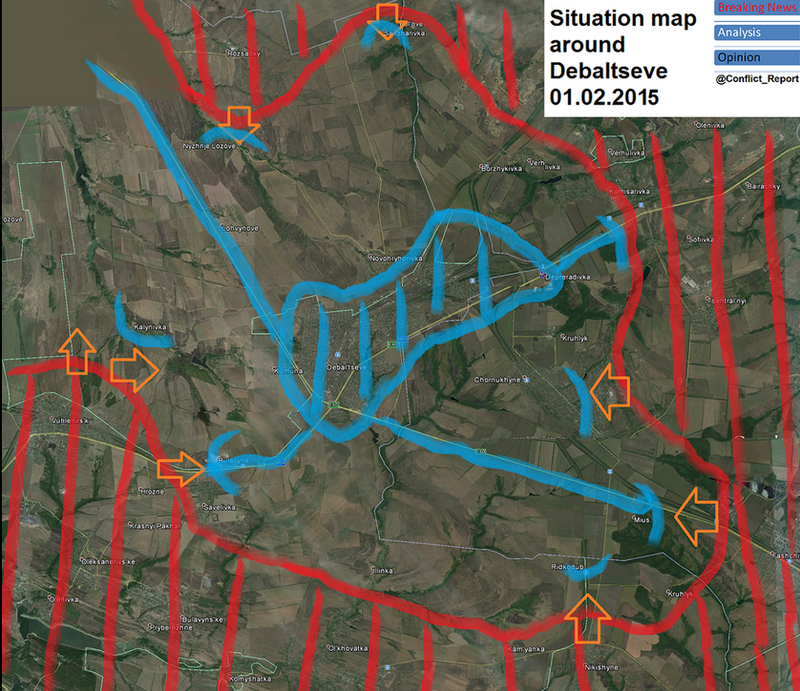 As a matter of fact, controlling Vuhlehirs’k and the territory to its north could even avoid a direct assault on Debaltseve as a lasting siege would force thousands on Ukrainian troops to surrender without a fight, running out of food and ammunition. The general Russian strategy in the area was also described in my article from January 27, predicting “the fall of Debaltseve is inevitable […] if there is no radical change in tactics”. As there is no sign on the horizon of this change to come, regular Russian army forces began their assault from Horlivka in the west and Kayutyne in the south on January 29. While on this day, only little footage was published, showing that they overran the outer defensive line of Vuhlehirs’k, losing at least one T-72B1 and taking several Ukrainian soldiers POW, early January 30, Russian state TV published extensive video footage of the battle and its aftermath. 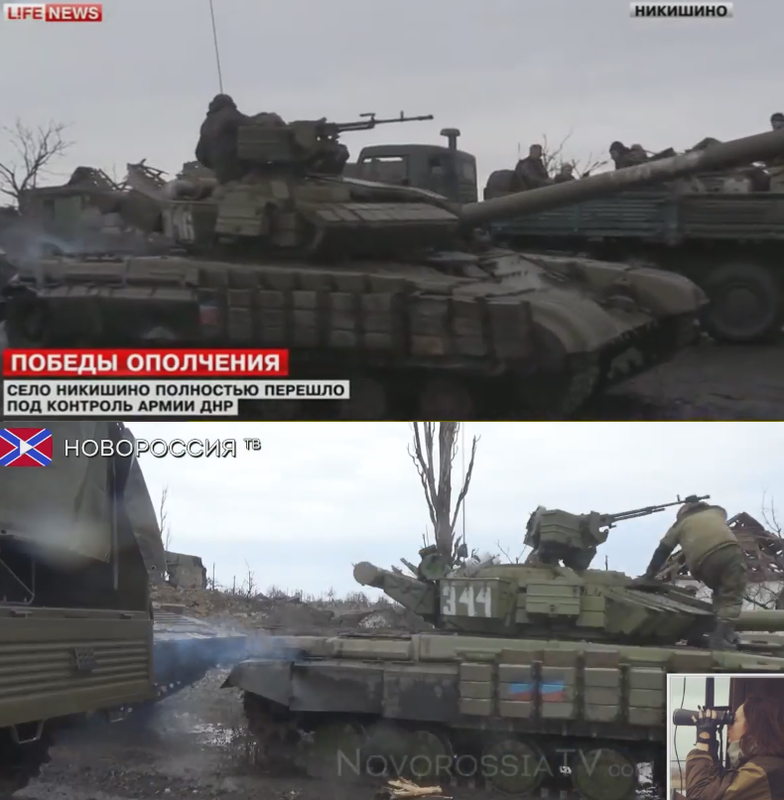 Already on the way to Vuhlehirs’k, many Russian army T-72 main battle tanks could be seen, proving this is no further faltering skirmish, but indeed the long anticipated major push, military forces would conduct from the daily resupplied and reinforced areas north east of Donetsk city. 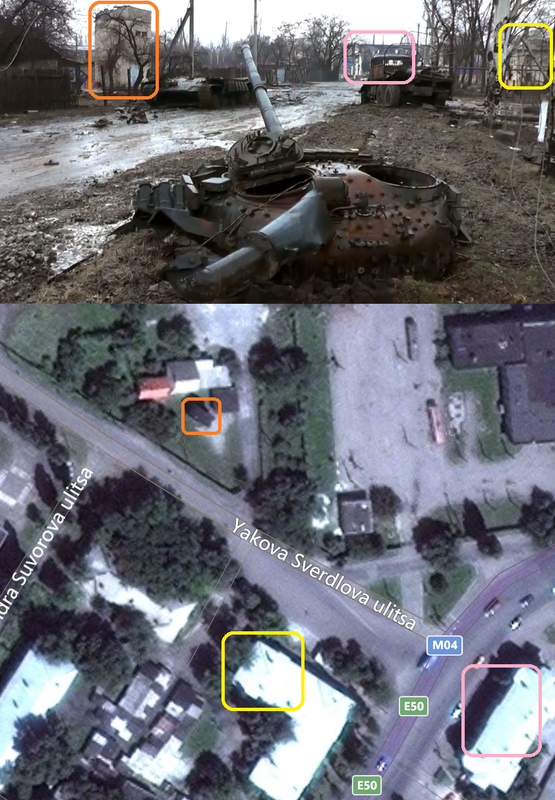 The following footage shows the brutality of the battle that took place on the western and southern entrances of Vuhlehirs’k, where Ukrainin forces put up fierce resistance and destroyed more Russian tanks (see picture below) and likely also many troops, which are not shown on Russian footage, but were outgunned and defeated in the end, allowing the Russian army to enter the center of the town. 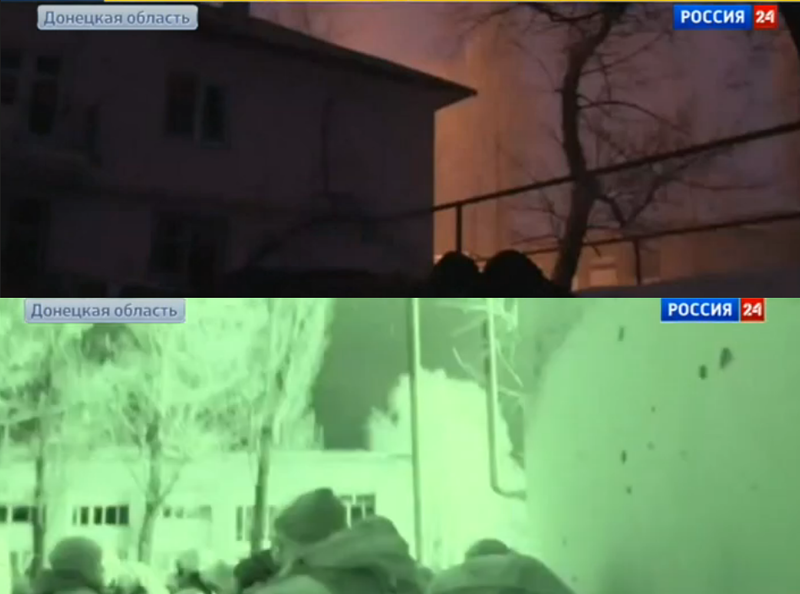 Next scenes of the analzed footage show the very center of Vuhlehirs’k, where fighting still took place and residential buildings around the main intersection of the M04 highway were burning. Some Ukrainian troops seemed to still resist as shooting was aubilbe and Russian forces were still in a cautios and nervous mood. 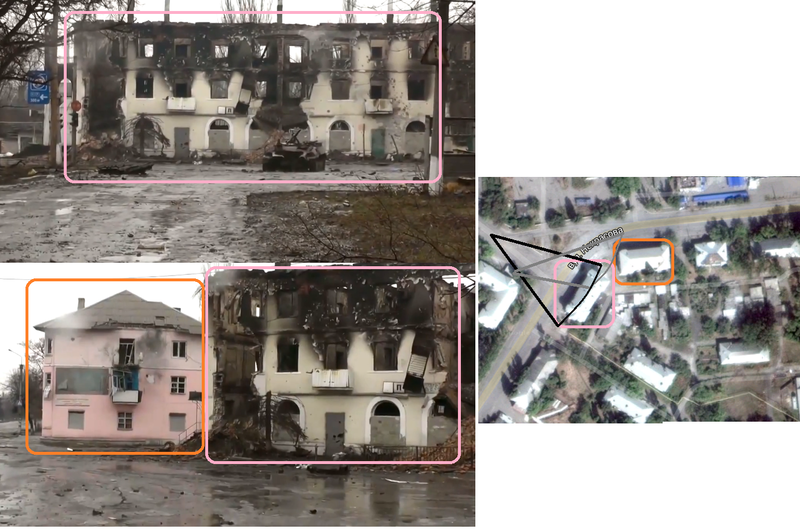 When the situation calmed down a little bit, Russian TV teams were able to take wider shots of the area, making it possible to geolocate and thus verify the footage. This enabled a clear confirmation of the fact that – at least yesterday afternoon – Russian forces were present in the center of the city, dominating its vital route to Debaltseve itself. At the same time, this geolocation and taking into account the previously analyzed footage made the creation of a strategic map of the battle and ground possession status possible – again – for this time yesterday afternoon. It shows that Russian forces indeed stormed Vuhlehirs’k from Kayutyne just south of it and a long the railway to the west, so from Horlivka and its suburbs. 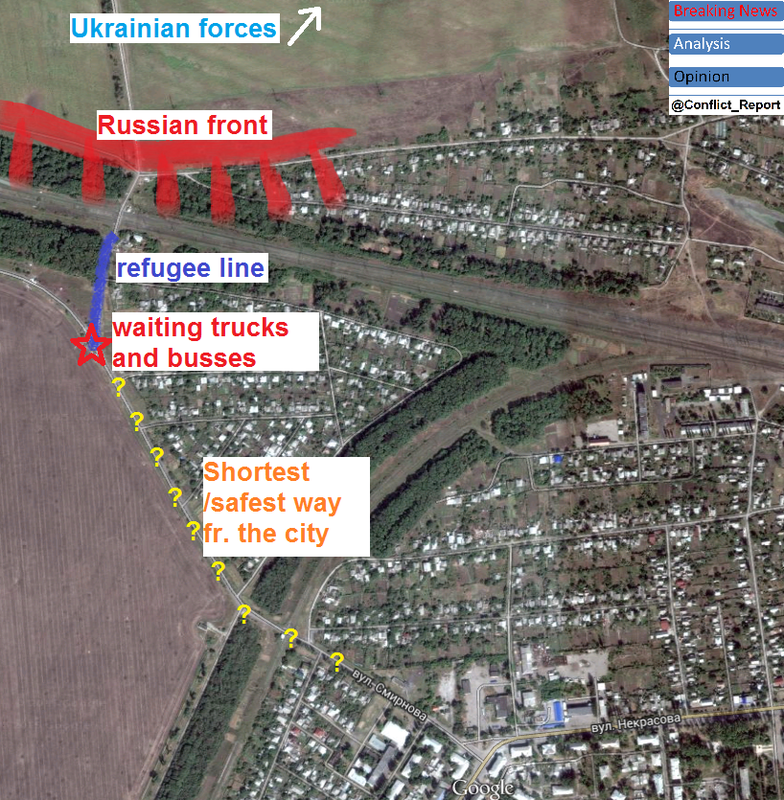 Both (footage analysis-based) assault directions were later confirmed by Ukrainian journalists and soldiers on the ground. The crucial question remains, what happened after yesterday afternoon. While the Russian propaganda claims, it caputred most of the town and the battle is effectively over, various Ukrainian sources paint totally different pictures of the situation. The commander of the well-known Ukrainian national guard force “Battalion Donbas” for example, said this morning on his facebook page that the town was lost. Shortly after, reports from journalists on the ground said, Ukrainian forces would hold the northern and eastern part of the town, starting from the train station. This version would perfectly correspond with the created map above. However in the afternoon, the Ukrainian government’s MP and interior ministry member Anton Gerashchenko claimed that entire Vuhlehirs’k was back under Ukrainian control due to “accurate artillery strikes and daring maneuvers of our tanks”. It is telling that this most official statement so far also claimed, Russian troops only managed to capture a “suburb” of the town yesterday, but were repulsed. A flagrant lie as this article has proven. But what really happened last night? Russian media footage shows intense Ukrainian multi launch rocket system attacks. 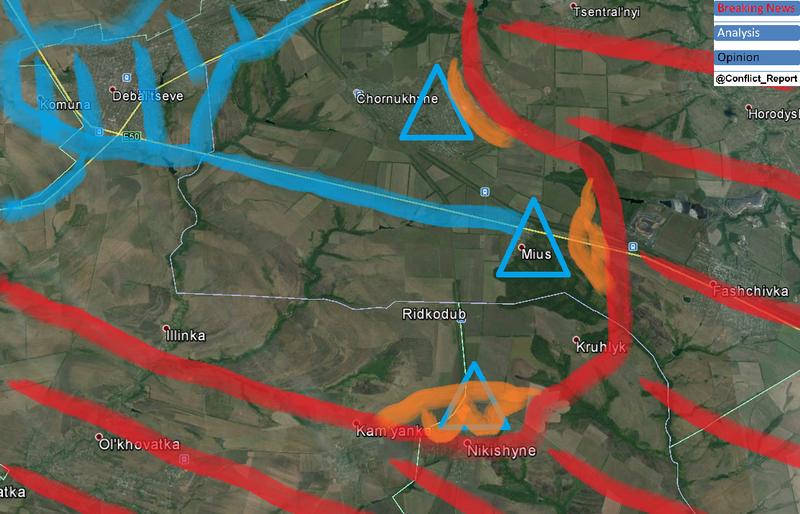 On the center of Vuhlehirs’k – and on Russian troops stationed their overnight. 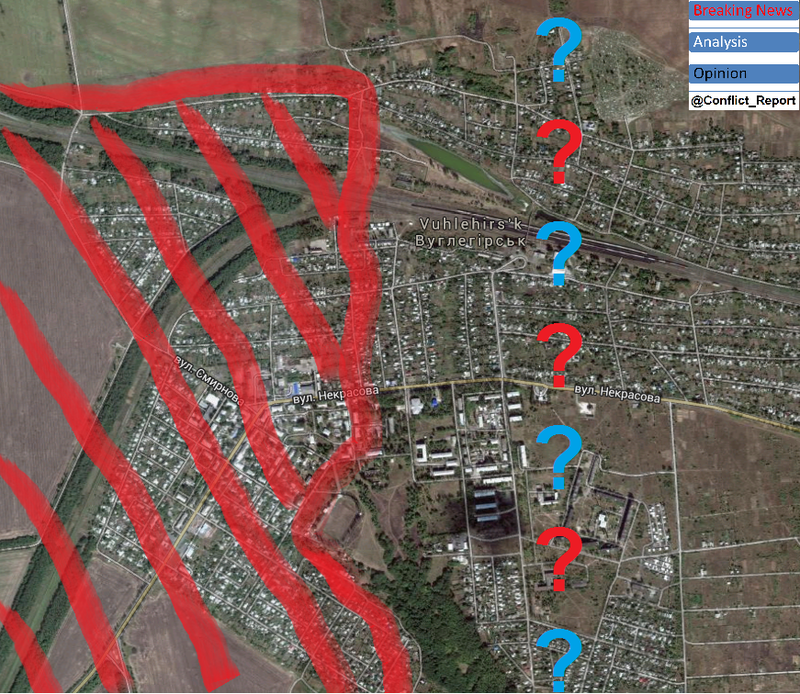 However, what is not shown are Ukrainian tanks or ground troops re-entering the city or any fighting from the Russian side. Instead it ends with Russian tank drivers, showing the victory sign on broad daylight. Despite the fact that it remains unproven if the latest scene really shows the day after or the time before the Ukrainian artillery / MLRS “counterattack” during the night, it must be doubted that the Ukrainian army either has the technical and manpower-related capabilities in the area to launch a counteroffensive on hundreds – if not thousands – of well-armed Russian troops in the town, enyjoing a steady flow of resupplies from Horlivka and Yenakijeve. Therefore, my final assessment of the claim would be that we are talking about the same “repelling” successes as were claimed for 5 days over the new terminal of Donetsk airport. All turning out to be untrue. 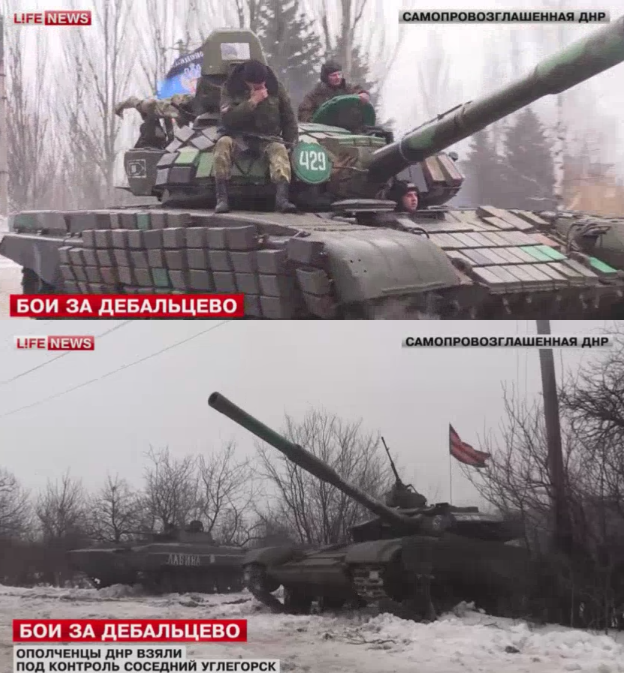 Shortly after the article at hand was published (in the evening hours of January 30), Russian LifeNews brang a report from Vuhlehirs’k, proving that the city has entirely fallen to Russian army forces and Ukrainian counteroffensives – if there were any – totally failed. 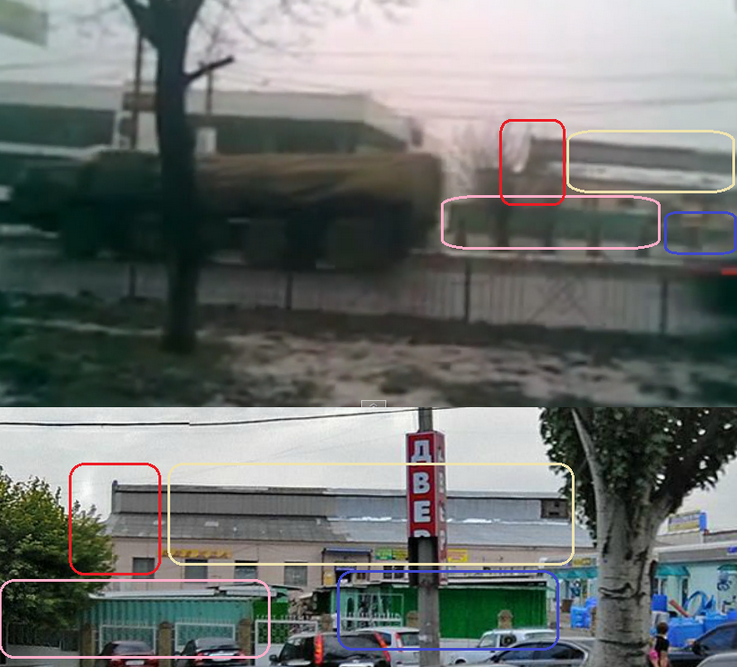 Video footage does not only show heavy tank and apc forces (T-64BV, T-72B1, BMP-2) inside the town today. It also contains geolocatable footage of a church in the northern outskirts of the town, showing Russian forces pointing their rifles to the north and the LifeNews “journalist” (not!) reporting without cover from possible small arms fire. 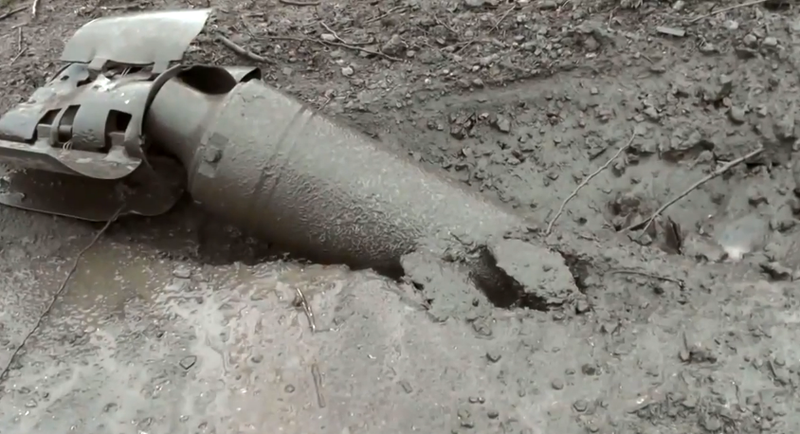 According to the LifeNews report, Ukrainian forces were pushed out of the town and are shelling it with mortars and artillery from Kalynivka in the north and Debaltseve. This seems to correspond with the footage itself. 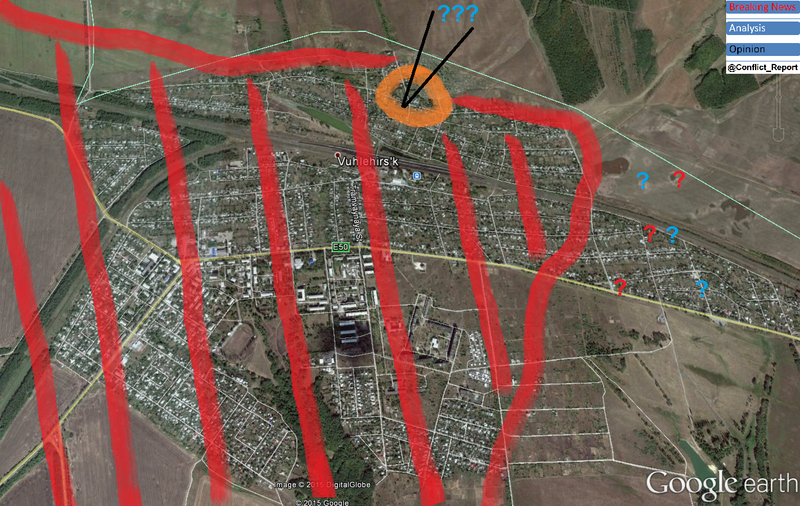 From a larger distance, the geolocated footage is evidence that Russian forces took over (at least) 90% of the town including the strategic train station, which was the front line earlier this morning according to this article (read above) and Ukrainian journalist reports. Looking at the powerful involved forces (dozens of tanks, apc and hundreds to thousands of Russian troops), there seems to be no chance the Ukrainian army will recapture the area (as it did not recapture ANY Russian-taken area since September last year). Knowing that the Russian forces are as quickly as possible moving northeastwards, it becomes clear where their aim lies. 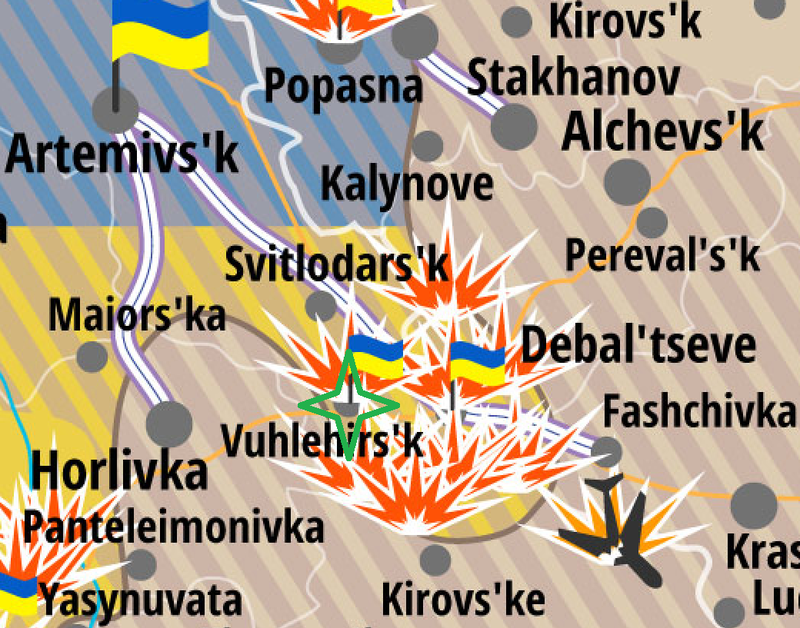 The target is to cut the M03 as soon as possible, creating a pocket with more than 5000 Ukrainian troops in Debaltseve. Looking at the speed of their advance, this might become true within days rather than weeks. In conclusion, I might sound once again like a broken record. I wrote 3 days ago “if there is no radical change in tactics by the Ukrainian side”, it will not only lose the “bridgehead” of Debaltseve, but entire Donbas. I continued warning that “purely defensive operations against an enemy with the fire – and man – power observed in eastern Ukraine during the last 4 weeks, leads to sustained territorial losses.” I have nothing to add to these statements beside calling upon the Ukrainian government once again: Act now or start digging trenches on the eastern outskirts of Kharkiv and Zaporizhia. Because this is where the current course of the fighting is leading sooner rather than later. Over the last 72 hours, increaring reports of regular “Russian army” deployments inside Ukraine emerged, not only from blogging insiders and investigative homepages, but also from the Ukrainian president and army command themselves (a very rare move, despite the widely dominating verbal calming down attempts). Nonetheless, footage to prove such “new” statements was lagging over the first days, a fact, understandable under the current circumstances of the Moscow regime, not willing to uncover its full-scale military invasion into Ukraine. However since yesterday, January 22, several undeniable video sequences from different front sectors across Donbas emerged, undeniably supporting the Ukrainian intelligence reports. 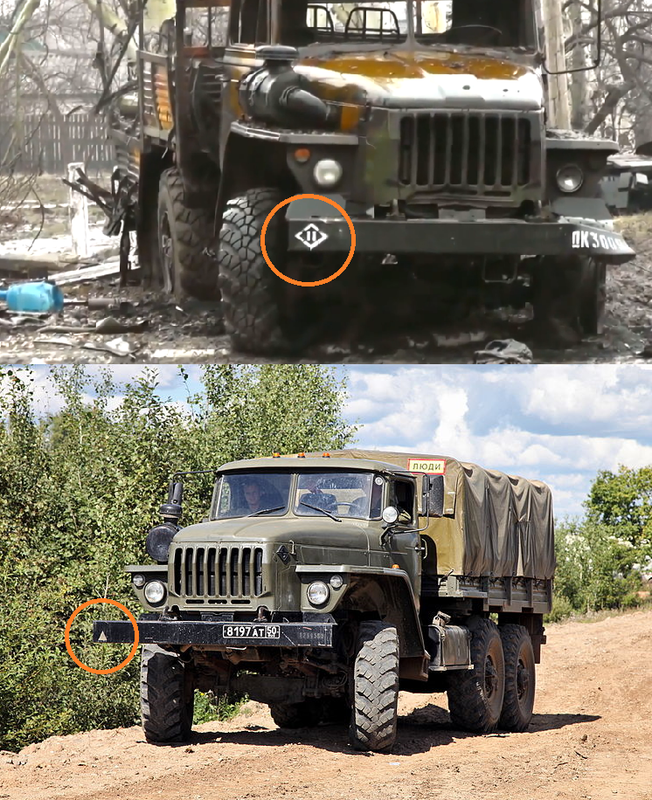 Most bulletproof evidence is the appearance of the most modern Russian army 2B26 Grad-K system mounted on a KamAZ-5350 chassis (pictures below) just a few kilometers from Donetsk airport. This refurbished BM-21 system was revealed in 2011 and delivered to the Russian armed forces from 2012. It is ONLY operated by the Russian army itself and there is no other source of such weapon system available. Further details are striking. The systems appears in Donetsk in fresh winter camouflage showing it was prepared for winter war and surely sent in under the current weather conditions. Also the “rebel” camera man pulls down his camera as soon as it leaves the line of 4 older BM-21, mounted on Ural-375D (a system, delivered in its hundreds by the Russian army to its proxies and forces in Donbas). He obviously has the orders to not film such system in that area and that time. However, he lifts it up 4 seconds too early clearing the sight of this 100% Russian army weapon system. In the evening of January 22, footage of a BM-30 MLRS system appeared, claimed to be taken in Makeevka, just a few kilometers east of Donetsk and less than 20 km to the nearest frontline. The BM-30 “Smerch” (also known as 9A52-2 Smerch-M) is the heaviest multi launch rocket system (MLRS) in its “family”, exceeding the smaller BM-21 and BM-27 in its caliber (300mm) and range (up to 90 km). 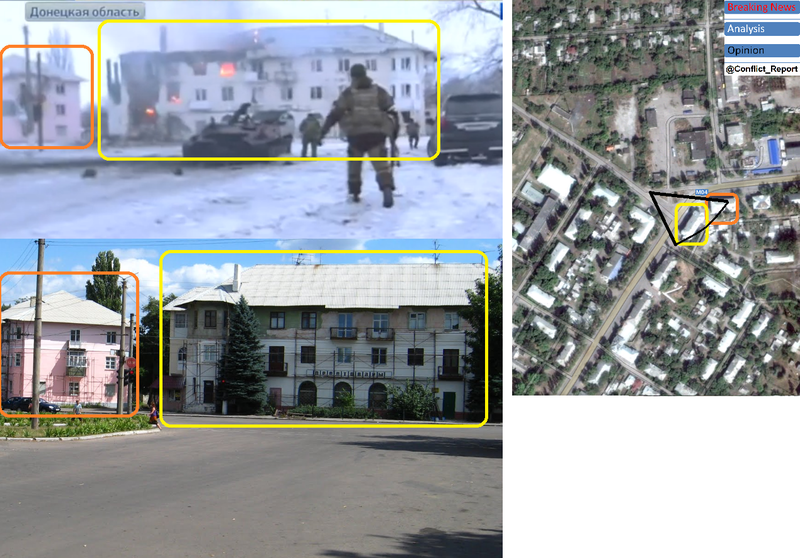 Independent geolocations of the footage by several expertes (e.g. Dajey Petros and me) confirmed the the location exactly where it was reported to be, so (very) close to the frontline for a system with such operational range. The system has never before been recorded in Russian-held territory for a simple reason: It was not there. While the Ukrainian army lost several weapon systems during the created boilers in August and September last year to Russian invaders, the BM-30 was always able to stay far behind the front due to its range and was never captured by “rebel” forces or the vast majority of Russian mercenaries and Russian army forces. Knowing that there is no credible narrative for the appearance of such heavy and exclusive system “in separatist hands”, the Russian invasion command abstained from sending the system to Ukraine over the following 4 “ceasefire” months, despite deploying thousands of other military vehicles like tanks, apc and smaller MLRS. However now that it goes “all in” and started an offensive to take entire Luhansk and Donetsk regions (and even more), the Russian army command decided to not spare this long range, deadly tool of warfare anymore, no matter the fact that this is another 100% evidence, it is fighting in neighboring Ukraine. But all these “smoking guns” might be disputed and denied as “so or differently explainable”, despite all indication leading into the same (Eastern) direction. Meanwhile the two above mentioned cases, recorded over the last 24 hours, provide sufficient evidence, regular Russian army troops are not just “located all around Donbas, ready to move in” – like acknowledged by many western media and security sources – but fighting on all front sectors inside Ukraine, reinforcing and replacing its pre-existing invasion forces. This article only lists NEW evidence that appeared over the last 24 hours and after the statement of Ukrainian president Petro Poroshenko in Davos. Of course, multiple Russian-army-only equipment appearances over the last 7 months (T-72B3, T-72B1, BPM-97, GAZ-3937, BTR-82A etc.) leave no doubt that it was and is the Russian army that exclusively supplies all anti-Ukrainian forces in the Donbas with weapons and exerts its surpreme command over them.